Vanished French Impressionists, 10: why are they forgotten? 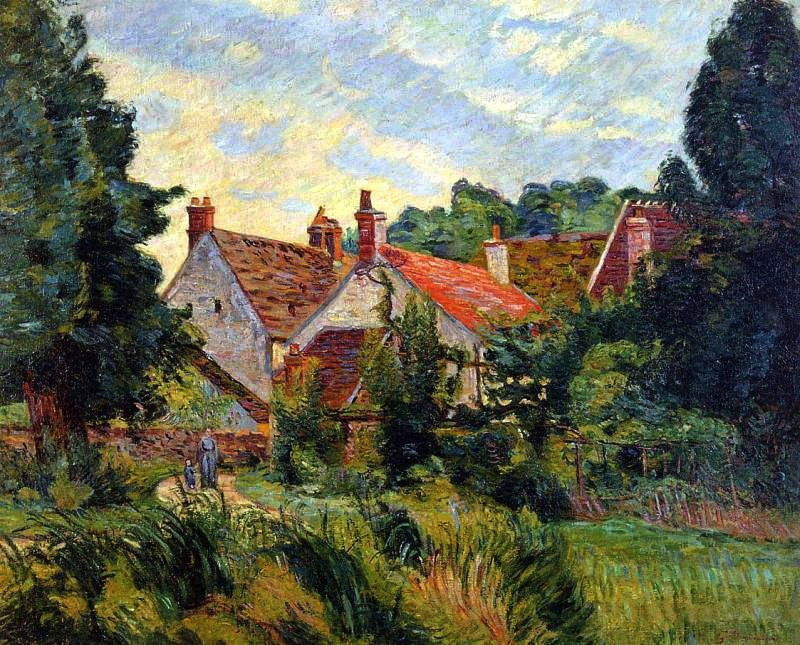 Alfred Sisley, who was often omitted and only recently restored to the mainstream group. History has been remarkably selective as to who is honoured, and who gets forgotten. Although most of the works exhibited were paintings, five of those who took part were not primarily painters. Two were successful sculptors, Zacharie Astruc and Auguste Ottin. Félix Bracquemond was an established print-maker and designer of porcelain, and it would surely have been more appropriate for his unfortunate wife’s paintings to have been shown. Alfred Meyer was a decorative painter in enamel. Léon Auguste Ottin created stained glass windows. Most of us can articulate what we consider to be Impressionist style in a painting, but few if any of those qualities can be extended to other arts, such as print-making and sculpture. None of those who took part in this exhibition appears to have developed an Impressionist style for another medium. This is unusual for what many would today claim to be the greatest change in art since the Renaissance, which of course had distinctive sculptural style. Four of the artists were probably welcomed for reasons other than showing their paintings. Astruc was important in his primary role as a writer and critic. Louis Latouche was a (minor) dealer who also became a colour merchant to several of the painters there. 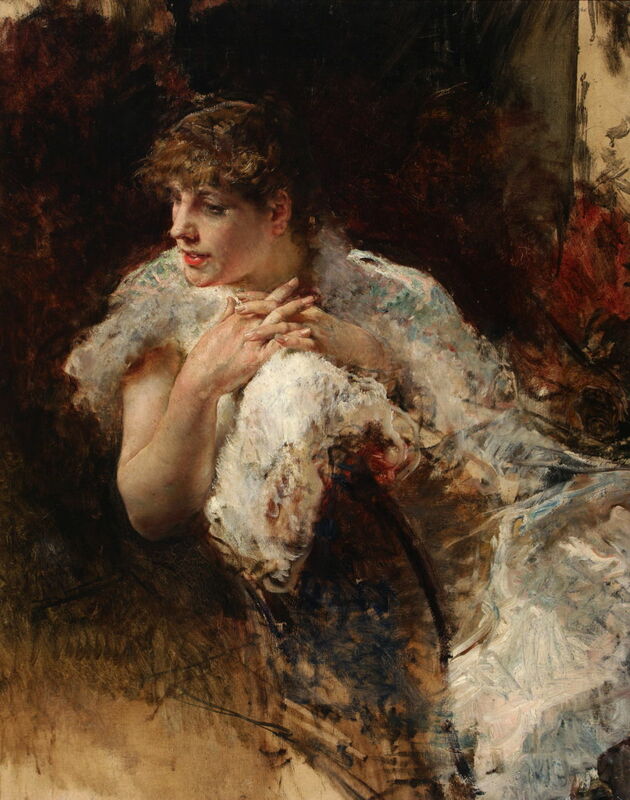 Henri Rouart was a major patron and collector; although his paintings are Impressionist, it is likely that they were less attractive to the other artists than his wealth and patronage. Giuseppe de Nittis was successful enough in his own right as an artist to be able to purchase the work of Monet and others, and seems to have been more accepted as a patron and collector than as a fellow artist. There were five whose work appears to have been quite out of place. Antoine-Ferdinand Attendu never seems to have been in the least bit impressionist, before or after 1874. Édouard Brandon was an important French Jewish painter whose work never became Impressionist in style. Ludovic-Napoléon Lepic was a marine painter who may again have been seen as a potential patron. Léopold Levert painted in the style of the Barbizon school, and Auguste de Molins was a realist. Three were independent painters before, and remained so despite their showing there. Eugène Boudin was acknowledged as a major influence on Monet and other Impressionists, but retained his unique style. Stanislas Lépine continued to paint in his pre-Impressionist style for the rest of his career. Giuseppe de Nittis was already successful and flourishing, and it was Degas’ hope that his inclusion would show that at least someone involved was not a failure (others have suggested that this was not the reason, but that de Nittis had fallen out with his dealer, Goupil). Édouard Béliard’s political principles seem to have become more important to him than painting, although he had painted in illustrious company, with Pissarro, Cézanne, and Guillaumin in the early 1870s. Three preferred to live and work away from Paris, and thus severed their connections with the movement, much as Cézanne did when he returned to Provence. Gustave-Henri Colin married into, and lived and worked in, the Basque country. Louis Debras probably returned to the Somme, where his records may have been destroyed in the First World War. Émilien Mulot-Durivage could not make a successful career in Paris, and returned to the coast of his native Normandy. A couple had lives which were tragically cut short, despite promising beginnings: Pierre-Isidore Bureau died in 1876, and Giuseppe de Nittis in 1884. There is just one, Léopold Robert, about whom we know next to nothing. Finally there are those who clearly deserve better. 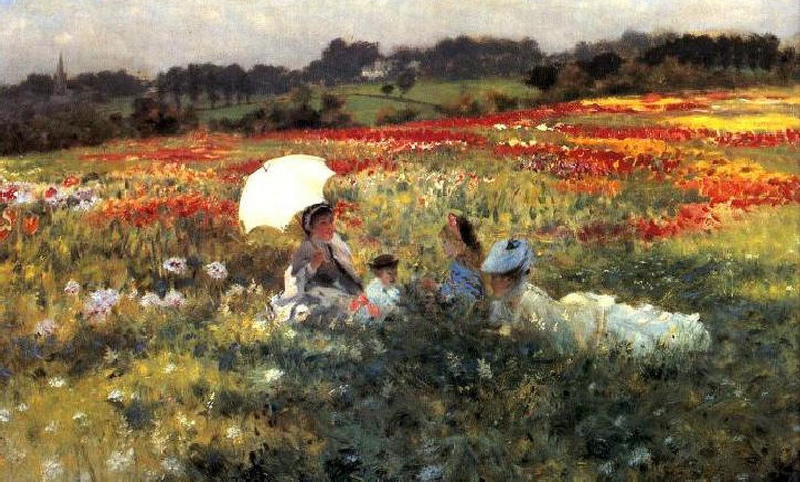 Adolphe-Félix Cals painted superb Impressionist landscapes, which became popular. Although neglected by almost every account of Impressionism, the massive book Impressionism (1993/2013), edited by Ingo F Walther (Taschen), claims that “he painted melancholy landscapes with stark contrasts of dark and light, and oppressive genre scenes of poverty, fishing communities and the life of workers.” I do not think that is a fair description of the works of his which I have been able to find, and showed here. 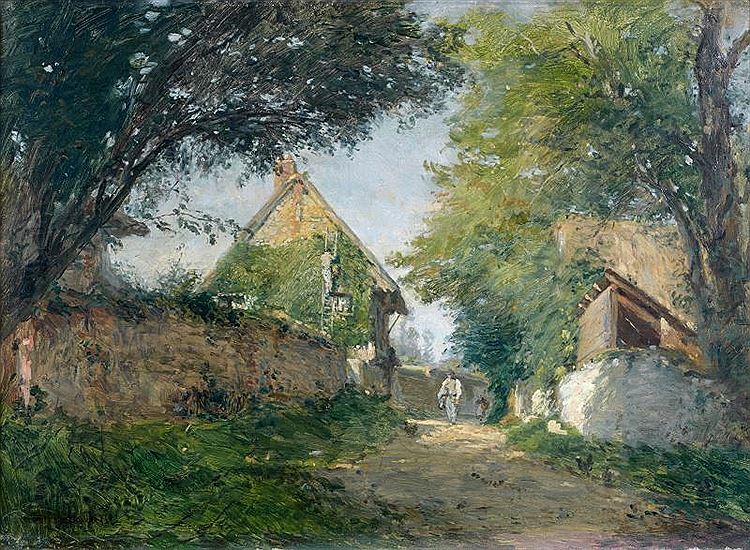 Adolphe-Félix Cals (1810–1880), Honfleur Alley (1877), oil on canvas, 43 x 59 cm, Private collection. The Athenaeum. 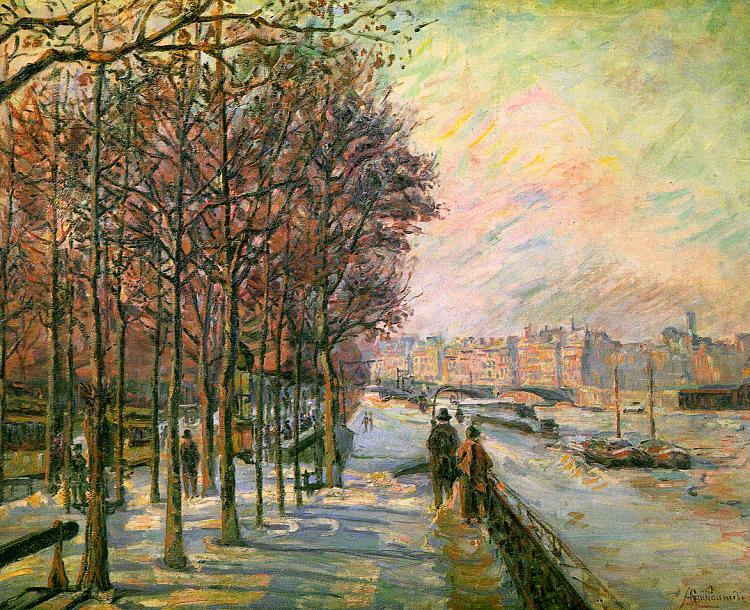 Armand Guillaumin is now starting to achieve better recognition, and inclusion in Impressionist exhibitions. For example, Suzanne Greub’s book and exhibition Monet, Lost in Translation (2015) (reviewed here) features several of his paintings, together with some by Boudin too. 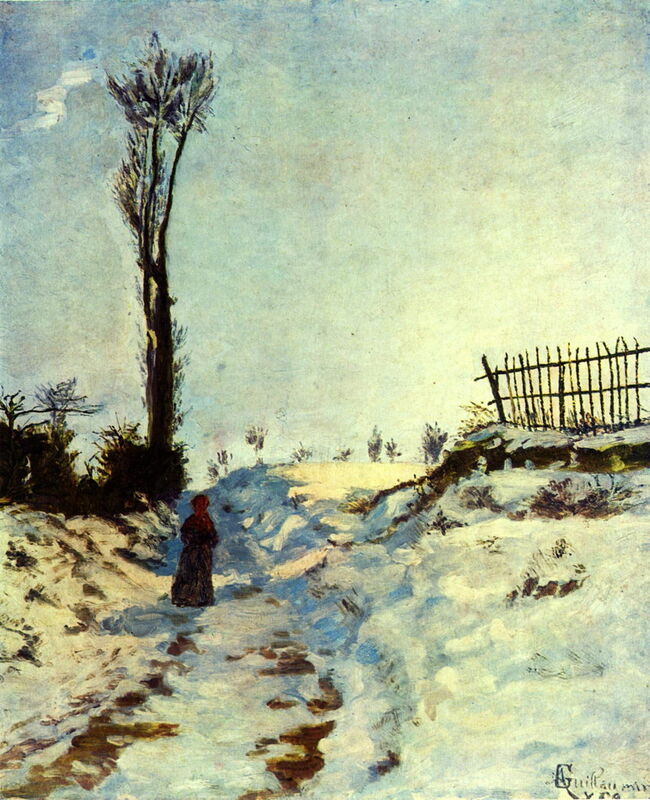 Walther’s massive book records that Guillaumin “painted numerous landscapes in the environs of Paris and on the Seine in lively contrasting colours and broad strokes of the paintbrush”, but again he is barely mentioned in most others. Giuseppe de Nittis had the disadvantages that he retained independence from Impressionism, and was successful in the Salon at the time. As a result he is often viewed as borrowing from the Impressionists when it suited him, and painting for popularity rather than art. As Walther’s book opines “Nittis’s bright, relaxed landscapes and city scenes, often in small format, and his anecdotal genre pictures of modern life are a successful compromise between Salon and Impressionism.” Inevitably he is excluded from most other accounts. I am obtaining further references on de Nittis, and will be presenting a more balanced and accurate account of his career and work in the future. The First Impressionist Exhibition is often viewed as a watershed in the history of painting. In fact it was a hodge-podge of different styles from artists who were not even part of a coherent group. Many of those who took part did so on the strength of friendships with ‘core’ members of the group, particularly of Pissarro and Degas. Just as the exhibition was a failure with the critics, so it failed to generate Impressionist styles in sculpture, prints, and other media. There is still plenty to learn, and to speculate, about that exhibition, and several great artists to rediscover. Posted in General, Painting and tagged Cals, de Nittis, exhibition, Guillaumin, Impressionism, painting, unknown, vanished. Bookmark the permalink.